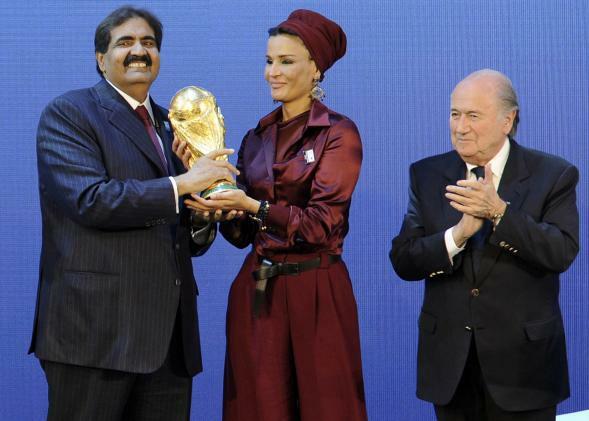 Qatar’s Hamad bin Khalifa Al-Thani and his wife, Sheikha Moza bint Nasser Al-Missned, receive the World Cup trophy from Fifa President Sepp Blatter on Dec. 2, 2010. The World Cup-hosting experience so far can’t have been what Qataris hoped for when the country was awarded the 2022 tournament at the end of 2010. Yes, there was immediate suspicion that not everything was on the level about the decision to have a country with little international soccer history, and where summer temperatures can reach 120 degrees, host the event. But it was reasonable to suspect that the concerns would blow over and the 2022 tournament would be a glittering showcase for the tiny emirate, which, powered by sheer ambition (and the world’s largest natural gas reserves), has sought to transform itself into a major player. Unfortunately for Qatar, a lot has changed in the last five years. At the same time, Qatar sought to build its cultural clout with the I.M. Pei-designed Museum of Islamic Art and campuses of several American universities. The world’s biggest sporting event would be the crown jewel, with $200 billion in infrastructure spending forecasted, not to mention the elaborate Zaha Hadid-designed stadium planned for Doha. But then, in 2013, Mohamed Morsi’s Qatar-supported Muslim Brotherhood government was overthrown in Egypt. The country’s new military government has viewed Qatar with suspicion, freezing diplomatic ties, jailing Al Jazeera journalists, and accusing Morsi of leaking secrets to the Gulf State. Fed up with Qatar’s support for Islamist groups, Saudi Arabia, Bahrain, and the United Arab Emirates withdrew their ambassadors from Qatar in March 2014. Globally, Al Jazeera remains a major media force, but the network’s American affiliate, which launched with great fanfare in 2013, billing itself as a more intelligent and sober-minded alternative to U.S. cable news, hasn’t made much of an impact in the ratings and has lately been roiled in an ugly workplace scandal. Meanwhile, the World Cup has turned into a PR disaster. The event has shined a global light on the kafala system, the predatory sponsorship scheme that keeps the emirate’s migrant labor force, mainly from South Asia, in indentured servitude. At the current rate, an estimated 4,000 workers will die in the lead-up to the World Cup. Qatar’s working conditions aren’t new, or—in its region—unique, but thanks to the World Cup, Qatar is under pressure not just from human rights groups and the international media, but also from the event’s corporate sponsors. Swiss authorities are vowing a new investigation into the allegations of bribery in FIFA’s decision to award Qatar the cup. Qatar’s government may feel it’s under an unfair spotlight right now, but it’s a spotlight it asked for.